My class really enjoyed this counting activity today. 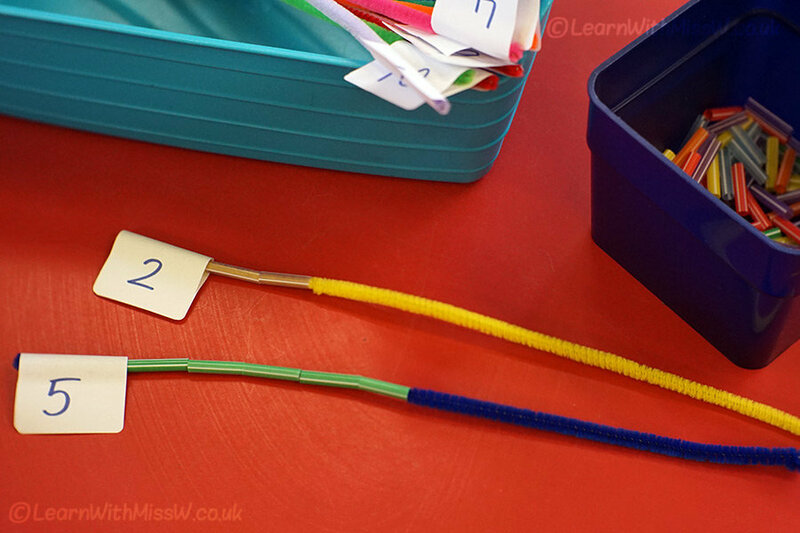 Threading cut up straws onto furry pipe cleaners, what’s not to love? It’s a bit easy for them now, but this is going to be one of the activities I use to introduce addition soon, so I want them to be familiar with how it works. I really would like the children to stick to just 1 colour so that when we use this in addition and put on a second addend, it will be clear what they are doing. Anyway, back to today, or even Friday, when I put together this activity. What was I thinking? The photo in this post was definitely the ‘before’ shot when the pipe cleaners were nice and straight and the labels were pristine. There’s a reason why I usually laminate things before I let 25 children loose on them, and I’m fairly certain at least one of the stickers has been torn completely off. I saw the pipe cleaner/sticker counting idea on pinterest, but I think I will need upgrade to a child-proof version if I want this activity to last beyond a week!